Goodbye, old friend. We’ve grown old together, you and I. Young, at first inexhaustible, with little thought given to consequence. Luck rode along on every single foot of every single mile of the way. From riding a desk at Easyriders and loafing along the Pacific Coast Highway to idling along the shoreline of Daytona Beach, cruising the Blue Ridge Parkway, or Valdosta, Georgia’s memorable Run to the Sun, we traveled the country on a journey of discovery and a sense of adventure for what lay around the next bend. You never gained a pound or lost a hair; just a few bumps and bruises that healed well. I’m unrecognizeable from what was then to what is now. You never changed your taste for 60-weight. I’ve grown a bit - a lot - more concerned about what goes into the tank. 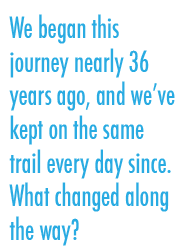 We began this journey nearly 36 years ago, and we’ve kept on the same trail every day since. What changed along the way? 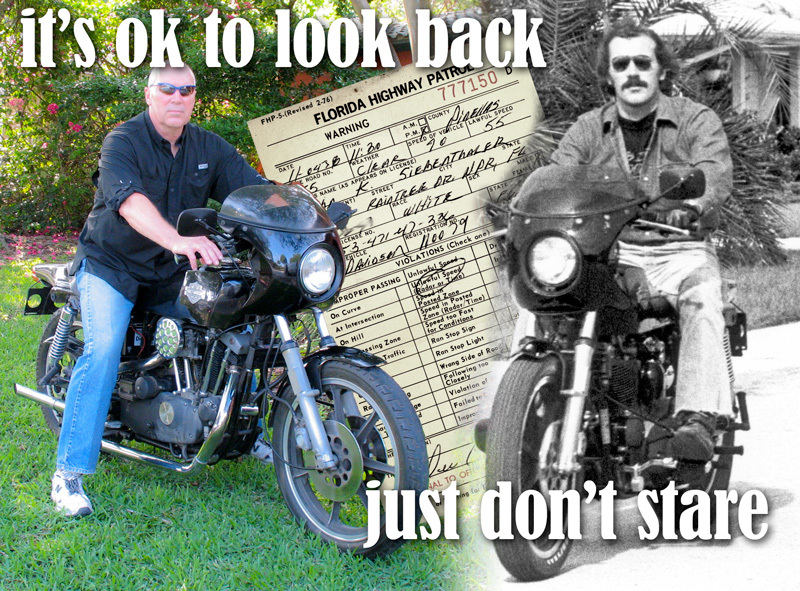 You started life as a limited production (1977 - 1978) concept bought cheap by most so they could chop what Harley couldn’t sell. As far as corporate was concerned, you were the Edsel of the day when Willie G introduced you to a market that said not interested to dual front discs and a solid state regulator. Ignition was still mechanical, and still fixable by the side of the road if need arose. Squishy dual front single rear disc brakes were new tech, while a halogen headlight replacement was installed as a major upgrade from the yellow-tinted and underpowered factory sealed beam incandescent. Oil was still sold in cardboard cans with tin tops and bottoms while silicon spray wasn’t on anyone’s radar. I limited my customizing to swapping out the distinctive crossover Siamese exhausts for classic hand-hammered to fit staggered dual drag pipes and an extended set of pullbacks to move the handlebar up and back. Bolt-on highway pegs up front that better managed longer hauls in a more comfortable seating position finished what little cosmetic alterations were available. A factory drag styled air cleaner let you breathe properly. Canyon carving? Oh, please! Lets just say that between the perfectly proportioned drag bars, a less than optimum front end setup, somewhat imaginary shocks and top-heavy tonnage that at times felt like I was dragging the Queen Mary through corners, road course performance comparisons never came up. Nights in bars, nights under the stars. Torrential tropical summer downpours, and the bitter humid cold of a freezing Florida winter. We were for that time a perfect match, from parking across from the Rock Store on Mulholland to parking out back of Robison’s H-D on what’s now called Speedway Boulevard and still there, after getting hijacked by corporate in the early ’90s. The feeling of a wide-open throttle powering up the Conejo Grade from Camarillo over to Thousand Oaks, blue flame exhaust from just right jetting recording my progress. The same feeling thundering up the approach to the old Sunshine Skyway bridge towering nearly 400 feet over Tampa Bay (before being rammed by a freighter and collapsing into the water in 1980), backing off just before hitting the open metal grating at the summit and the dizzying effect of looking down at the black water far, far below my feet. Early morning rides along the citrus scented back roads of central Florida orange groves. One memorable night cruising home through ground fog that clung to the land in a layer that ended just above the headlight - sit up, and the view was of a soft luminescent pillow stretched out in front as the low beam was absorbed by the cloud of moisture, the road all but invisible through the mist. Serendipity. Like the time we were traveling down I-75, midway between a weekend in Gainesville and home 160 miles south, when I pulled off for a quick Mickey D and discovered one of my long time biker buds sitting on the curb out front, taking the same return path from a weekend spent hanging out in a Georgia saloon. We finished the ride together, Sportster and Knuckle. Figure the odds. What you did was look and sound great. Ride comfort was something to smile about, but when it came to profiling it was in the moment. There was nothing else like an XLCR - the only one in whatever parking lot anywhere I found myself in. You were, as they say, an attention getter. Our timeline began when Walter Cronkite still anchored the CBS Evening News and Jimmy Buffet’s A Pirate Looks At Forty was still far, far out at sea. Disco was nearly at its peak, just not for us. The weekend ritual started with a wash and AC/DC’s Highway To Hell, Back in Black, Aerosmith's Back in the Saddle, or Jay Ferguson’s Shakedown Cruise. Thanks to stitched-to-order black Bates leathers and a tiny splash of chrome bling to set things off the center of attention was never far off. Labor for tune-ups then was under ten bucks: that included installing a set of points, a condensor, two plugs and an oil change, setting the timing, running the valves, and adjusting the chain. On the other hand working on your own bike led to a deeper relationship and over time became, with the help of feeler gauges, spark plug gappers and ignition wrenches nestled in the top drawer of the red Craftsman rollaround, therapeutic beyond what was required. So after 36 years, most of it sitting unused, untended and unridden as several Shovelheads came, got chopped, and went while amusement was also found with a bagger for awhile, it was time. With the certain knowledge that I’d never again feel the excitement of backing into a parking space of a newly discovered biker bar with others my age as it was then, not as it is now, you went on the market. 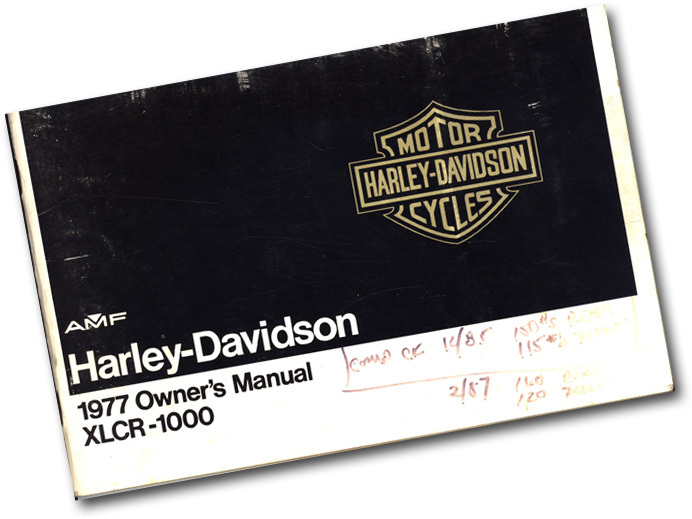 Time to let someone else deal with the issue of sourcing parts and gaskets not available at a Harley-Davidson dealer for decades. Time to accept the fact that riding in these times, on these roads, among today’s drivers, carries risk that distracts from the journey. Time to realize that even if the opportunity arose, neither my heart nor my wallet was into the full restoration you deserved. For all those years, day in and day out, I passed by your garage presence many times daily, occasionally - very occasionally - backing you out for a wash and a little wax every six or 18 months. During most of those years, visitor’s occasionally might ask what kind of a bike you were. And I’d just say, that’s a Harley. My Harley. What’s next? Who can say. I like to think a dualsport. Maybe a cafe racer, from a sturdy donor bike, metric probably, that’s less a thoroughbred and that wouldn’t mind a nip here and a tuck there. But not around here. The bar blasting, profiling, and long hauls over wide open interstates and pre-redlight camera city streets are just the stuff of memory. Goodbye, old friend. I hope you’ll remember our adventures. I know I’ll never forget.